This summer is winding down, but it’s also presented me with an interesting opportunity. 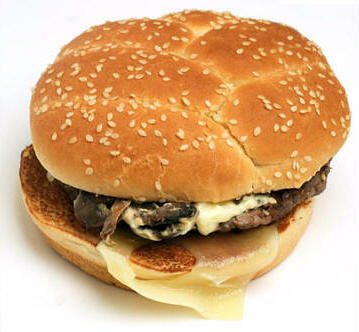 Both McDonald’s and Burger King are currently running Mushroom and Swiss cheeseburger specialty sandwiches. To make sure you’re getting the best Mushroom and Swiss burger possible, I’ve put together a review of both. Pretty much tells you everything you need to know. Let’s begin with the burger I had first, Burger King’s Mushroom and Swiss Steakhouse Burger. This burger is enormous. It stretches beyond the bun on all sides. The patty itself is decent, nothing to complain about but nothing too noteworthy about it either. The Swiss cheese was fine, as were the mushrooms, although the mushrooms were a little stronger than I’d expected. The burger also included those crispy onions which seem to be all the rage right now. The major flaw in this burger, and the reason I wouldn’t get it again, is the sauce. The sandwich includes some kind of steak sauce, presumably because it’s a Steakhouse Burger. Granted, I’m not a big fan of steak sauce in general, but the sauce on this burger clashes horribly with every other element. The burger alone cost $4.49. Overall, I don’t think this sandwich is worth buying, especially not at that price. The McDonald’s Mushroom and Swiss Angus Third Pounder is an improvement in pretty much every way. The patty is more flavorful. There are two slices of Swiss. While large, the burger is far more manageable. But the main improvement over Burger King’s is the inclusion of mayo as opposed to steak sauce. The mayo is understated, and works with everything else rather than clashing. This is just a better burger. It’s also cheaper, at $3.99 a sandwich. Unless you’re unnaturally fond of steak sauce and don’t mind paying extra for it, McDonald’s is the clear winner. Better luck next time, Burger King!! P.S. This seems like as good a time as any to address this. “Angus” refers to a couple different breeds of cattle. “Angus Beef” is beef which comes from these cattle. Whether on not it tastes better or worse than beef from any other kind of cattle is entirely a matter of personal opinion. This whole “Angus Beef=Premium Beef” idea, the idea that Angus Beef refers to a higher class or standard in beef quality, was cooked up by the beef and fast food industries. If you want to buy a more expensive burger because you want a larger portion or you like the ingredients, go for it. But please, don’t shell out more money because companies tell you their beef is better, because generally it isn’t.